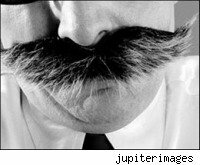 Do mustachioed Americans really earn more? Read all about it! The headlines were unequivocal: The New York Daily News screamed "Wanna make more money? Try growing a mustache." NBC News went with the more authoritative, "Study: Men With Mustaches Make More Money." In India, The Deccan Chronicle offered: "People with mustache are paid well." And Iran Daily tried out a tentative "Mustached People Earn More." The four news organizations, along with dozens of blogs and news aggregators, proceeded to report the startling statistics: "Men with mustaches earn 8.2 percent more than men sporting beards and 4.3 percent more than clean-shaven men." The first lead in this search for the truth about mustache economics was something that three of these four articles shared. They cited a Reuters press release that reported on a study commissioned by Quicken (INTU) and The American Mustache Institute (AMI), an "advocacy organization" for mustache wearers. That study turned out to be a "white paper," a very serious-sounding document titled "Saving and Spending Patterns of Mustached Americans." Authored by Dr. Hans Menjou-Bärtchen, a German researcher, it claimed to be the result of a poll of a "random sample of 2,000 Mustached Americans, 2,000 bearded Americans, and 2,000 clean-shaven Americans." In addition to his conclusion that mustached men had higher incomes, Dr. Menjou-Bärtchen made several bold assertions about male spending patterns, stating that the average clean-shaven man hands over 15 percent of his income for Dockers pants, 13 percent for vitamin supplements, and 8 percent for Zima. Bearded men, on the other hand, allegedly spend 18 percent of their incomes on automatic weapons, 14 percent on breakfast pastries, and 12 percent on overalls. When I googled Dr. Menjou-Bärtchen, the plot thickened: Every internet mention tracked back to either a Reuters-based article or the AMI's original press release. Upon further study, I learned that -- according to Time's "Curious Capitalist" blog -- "Menjou-Bärtchen" is German slang term for a pencil-thin mustache. I also discovered that the good doctor's prior studies included the exotically titled papers "The Primate Gambling Addiction" and "The Back Hair Equation." Hmm. Had anybody at Reuters bothered to do any basic checking on this story? Then again, the venerable news service was already dealing with a little embarrassment over its recent article claiming that the U.S. Chamber of Commerce was now endorsing climate change legislation. Too bad the Chamber's press release announcing this startling policy about-face was a hoax. Knowing that Reuters should get a chance to explain its pickup of Dr. Menjou-Bärtchen's study, I spoke with a public relations spokesperson there who wearily prepared to explain -- yet again -- how the company had gotten suckered in by the Chamber of Commerce hoax. While it might be a stretch to say she seemed pleased when I mentioned the mustache hoax, she at least sounded interested. I gave her the relevant information, and she promised to call me back quickly. A few minutes later, she was on the line, firmly asserting that the mustache study was not a hoax, and that it had been based on a real survey. She was so sincere, in fact, that I began to question my own assumptions. Could the study's findings possibly be correct? Granted, I don't personally spend 11 percent of my income on Budweiser and Canadian whiskey, but who's to say that I'm not a mustache outlier? After all, this was Reuters on the line, standing behind the study. Who was I to question one of the pillars of the old media? Clearly, I needed to do a little more digging. When I called the AMI's hotline (877-STACHE-1), the answering machine informed me that I had reached "the ACLU of the downtrodden mustached American people and the only facial hair think tank in the world." Soon, I found myself speaking to Dr. Abraham Jonas Froman, CEO of the Institute. Froman's name sounded oddly familiar, but I chalked that up to the fact that I had spent the morning researching the story. While the estimable Dr. Froman stressed that the mustache poll was legitimate, he admitted that it had actually been conducted on the internet, using a "rudimentary polling apparatus." He went on to note that the conclusions about expenditures were tongue-in-cheek, as were the references to Dr. Menjou-Bärtchen. Looking back at Reuters' press release, I noted that, although it quoted the fictitious Menjou-Bärtchen and incorrectly claimed that the survey was based on a "random sampling," it hadn't reprinted any of the study's more bizarre conclusions, suggesting that, while the service had been mildly punked, it hadn't really gotten completely suckered. Later, however, I found a second Reuters article that dutifully reported even the most outrageous parts of the study. Resolving to leave no claim unchecked, I decided to verify "Dr." Froman's pedigree. He had told me that he had an International Studies PhD from Purdue University. After spending hours repeatedly calling the university for an answer, I ended up paying the National Student Clearinghouse $6.50 to determine that "Abraham Jonas Froman" did not have a doctorate from the school -- and that Purdue didn't even have an International Studies program. Plus, one of my co-workers pointed out that "Abe Froman, Sausage King of Chicago" was the pseudonym Ferris Bueller used in Ferris Bueller's Day Off. Realizing that the study probably gained a patina of respectability from its co-sponsor, I decided to track down the Quicken connection. A few phone calls later, I was talking to Chelsea Marti, a public relations manager for Intuit, Quicken's parent company. Laughing, she acknowledged her company's relationship to the mysterious AMI, and admitted that the study was largely tongue-in-cheek. She then told me that Quicken was co-sponsoring AMI's 'Stache Bash 2009, which the AMI site describes as "a ridiculous celebration of mustaches and music." Marti went on to note that "70 percent of Americans live paycheck-to-paycheck" and that Quicken was using the event as a consciousness-raiser "to help mustached Americans to better manage their finances." In further pursuit of journalistic fairness, I asked Stephen Shepard, dean of the City University of New York Graduate School of Journalism, for his take on the Reuters' articles. After I mentioned the central role of the American Mustache Institute in the study, he said that, "If it came to me, I would have raised a flag and checked it more thoroughly than a release from the Federal Reserve or the Brookings Institute." I later called Reuters back to discuss this point, and was told that "The story [...] was based on a legitimate survey according to the company's PR person. This story was written in a humorous fashion, and it's hard to believe that anyone who read it would have interpreted it as otherwise." As my research showed, the definition of "legitimate" can be pretty flexible, and Reuters' clients sure seem to have "interpreted" the story as straight news. Admittedly, thorough reporting and checking doesn't come cheap: In the course of writing this story, I made more than 15 long-distance calls, spent several hours on research and analysis, and blew $6.50 on verifying what was clearly a very amusing hoax. It would be fun to take a few cheap shots at Reuters for its failure to spend the big bucks needed to dig to the bottom of the mustache story, but hey, anyone can make a mistake. However, I am firmly in the "new media" camp, and the conventional wisdom these days holds that my voice is less reliable than that of stalwarts like Reuters. After all, the Daily News, NBC News, and Iran Daily all ran their stories based on the Reuters report (and reputation), and the Deccan Chronicle seems to have gotten its lead from the Daily News. That means Reuters' imprimatur set up the story for at least two further generations. All four outlets ran the story as straight news, without a hint of irony. I'm not sure that would have been the case if they had gotten their lead from me. In the grand scheme of things, this is a small, funny piece about a small, funny organization. However, whether the story analyzes an oddball survey or predicts the downfall of Western civilization, the key selling point for traditional media is that it's reliable. We all depend on Reuters and its ilk to distinguish fact from comedy -- and to dig deeper than the average citizen (mustachioed or not) to uncover the truth. Still, aside from any old vs. new media arguments, let's just say the goal of both should be to strive for accuracy -- no matter how much effort it takes.